On November 9, 1606, German intellectual Hermann Conring was born. Conring made significant contributions to the study of medicine, politics and law. He made significant studies on blood circulation, and later in his career addressed himself to politics. Conring was polyhistor and Reichspublizist, as well as medical doctor and personal physician of Queen Christina of Sweden, Danish State Councillor and director of the Bremen-verdische Archive in Stade. He is regarded as the founder of the science of German legal history. In addition, Conring also conducted research in the fields of philosophy, physics and medicine. 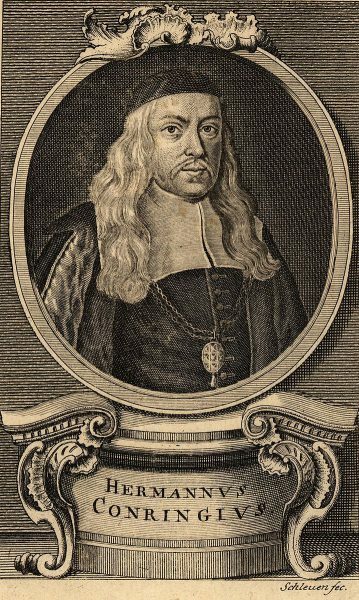 Hermann Conring was born into a family of ministers in a town in East Frisia, a territory ruled at that time by the counts of Cirksena, which would later become Germany. Early, he became familiar with the Latin language and ancient classical writings. In 1623 Conring had to return to the north at the request of his parents due to the effects of the Thirty Years’ War. One year later he returned briefly to the university, but due to a plague epidemic in 1625 he already made his way back to his parents’ house. At the University of Helmstedt, Conring studied philosophy starting at the age of only 14. In 1625, Hermann Conring followed an invitation by Matthias van Overbeck to study at Leiden University. There, he developed his interest in science and medicine. From 1634 he turned therefore to medicine, since it was better to earn money here, was awarded a doctorate in medicine on 29 July 1634 and shortly thereafter, with a thesis on scurvy, also acquired the doctorate. The approaches he developed in the field of natural philosophy can always be traced back to Aristotle. Based on this, he always advocated polyhistorism in his lectures. During his teaching activity in the field of medicine he gave an extensive textbook entitled Introductio in universam artem mediciam singulasque eies partes (Introduction to the whole of medicine and its individual parts). Here, too, we find the approaches already advocated by Aristotle. Conring also dealt with William Harvey‘s teaching on blood circulation. In his lectures on the fundamentals of medicine, he attached great importance to practical experiments, although it was often extremely difficult to obtain corpses suitable for anatomy lectures. In addition to his work in medical research and practice, Conring was also a personal physician at various European ruling houses. Hermann Conring is regarded as the father of German legal history. It is believed that already at Leiden University, he developed a great interest in the topic and began to research into the development of German law. In 1643, he started to get involved with the constitutional law of the German Reich which he also reflected in his lectures in the years after. In his major publication De origine iuris Germanici from 1943, Conring refuted the Lotharian legend and proved that there is no legislative act of Emperor Lothar III of Supplinburg, who made Roman law into imperial law. Conring not only dealt with the history of laws in force in the German Reich, he further included the institutions issuing them in his deliberations and discussed against what background the laws had a certain effect. Methodically, Conring’s work did not deal exclusively with the history of laws in force in the German Reich. Rather, he also included the institutions that enacted them in his considerations and ultimately wondered against what background the laws had a certain effect. His book was published in three editions illustrating the development of German law from the time of the Germans to Franconian and post-Franconian times. However, the contemporary reaction to the work was mostly negative and Conring was even accused of plagiarism by Johannes Gryphiander. Fasolt, Constantin (2007). “Hermann Conring and the European History of Law”. In Ocker, Christopher; Printy, Michael; Starenko, Peter; et al. Politics and Reformations: Histories and Reformations. Studies in Medieval and Reformation Traditions. 127. Brill.